So as I already excitedly mentioned I had a wicked race this weekend finishing 11th, just 8 seconds off 10th place. It was a bit of a dramatic lead up to the race as I noticed on Tuesday that my name was not on the Start List. I immediately contacted the CCA and they assured me I would be able to race. Thursday I register, but learn that as a penalty for late registration I must start at the back of our 80 women field. This is after spending a lot of coin getting to Europe to get some experience and a good start position for this key World Cup in my Season. Let’s just say I was a little frustrated! I had registered on time, but due to an administrative error I was left off the list and penalized for another’s mistake. Turns out there were at least 5 other fast Euro women affected by this new “rule”. My Norco support Kevin was a wicked advocate for me and many teams not affected by this rule stood up at the manager’s meeting to show their support for the relegated riders and the unfairness of penalizing the riders when the teams and organizations would already be receiving a fine. Long story short, I started with plate number 79 rather than 24 and last row rather than 3rd. My job was the same though and I was focused and ready to get it done. At 11:00 we were off, but only seconds later the pack in front of me was slowing and swelling to the sides as riders tried to dodge a crash. As I rode by I saw a very shocked Kiara on the ground trying to avoid the onslaught. I briefly tried to reassure her as I rode by, but what can you do in that situation? As soon as we were past the crash we were on the pedals again and hammering through the start loop. 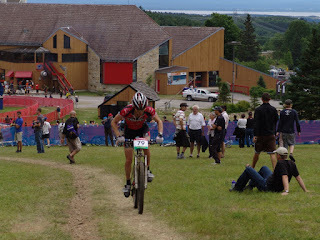 I made up 20 positions, before Trish Sinclair flew past me encouraging me to go with her. 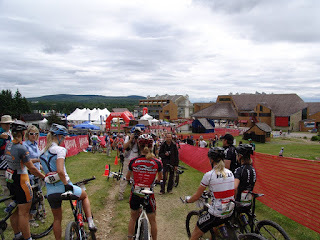 I dug deep into the first climb and passed as many women as I could so that I had a pretty open run at the descent. For the rest of the lap I was standing up and hammering wherever I could to gain a position or two. I came through at the end of lap 1 in 21st position. I followed the same game plan for each of the four following laps, attacking the climbs hard and keeping off the brakes whenever the course turned downwards. By lap three I had worked my way to 11th position and spent the next two laps trying to reel in 10th. On the last lap I was successful. I moved into 10th mid lap but Lene Byberg was right on my wheel. On the last single track climb she took a line through the woods I hadn’t seen gaining the lead as well as a couple seconds. I could have used that line earlier in the race! So she pulled ahead and I wasn’t able to bring her back, but it was damn close! So it was done. I love this course and it was good to me again. It was a wicked race and qualification to the Olympic pool. Of athletes in the pool those (2) with the most points; counting 2 world cups (2008) and World Championships (2008), will be selected for the 2008 Beijing Olympic team. Going into the Season I really thought 2008 was a LONG shot, but it seems more possible now. I just have to keep getting faster! My Norco and family support was awesome and both lead to a great race weekend. Sunday we watched Fionn race. After a smoking fast first half of her race she flatted and moved out of podium contention. Downhill is so frustrating that way!!! But she bounced back from this disappointment and finished 2nd in the 4 cross after a very aggressive race with many crashes. Tomorrow I’m headed out riding with Ride Guide to do some filming on the local trails. I’ll let you know how it goes. I just wanted to say congratulations. You are doing awesome! Hey girl, Awesome to hear from ya! Any word on our upcoming 10year reunion?? Kim just had a baby boy (Nicholas). World Cup wrap up: 13th at World Cup #3!!! !